Thank You to Dog Photos UK & Otto for this lovely article. 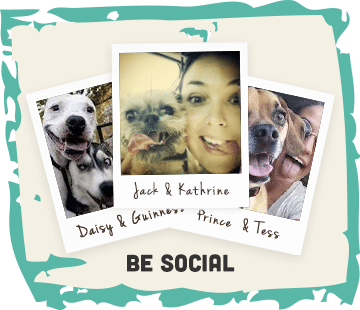 We feed Otto RAW dog food, produced and supplied by Natural Instinct. Otto went onto this when he was about 10-12 weeks old and it suits him and us as well. He looks great on it and he is so calm at home whilst being extremely active outside. For us RAW food is as close to what dogs would eat in the wild and that just makes sense to us. That being said RAW dog food does have some drawbacks, mainly the handling & storage. We have two freezers in the garage and even after a year, we are still constantly having to remind ourselves to get a few packs of the frozen food out so that it is defrosted in time to feed. Add to this complications of going away for a few days with frozen RAW dog food without a freezer and you can understand why some aren’t keen. So what are the alternatives? Well of course there are loads of wet and dry foods that aren’t RAW but it’s a bit of a minefield that’s for sure! One of the newer types of dog food is cold-pressed which means you can have many of the benefits of RAW dog food in a dry non RAW format. The biggest problem with dry kibble food is the extrusion process which cooks all the ingredients and can take a lot of the goodness out. Cold pressing doesn’t do this. 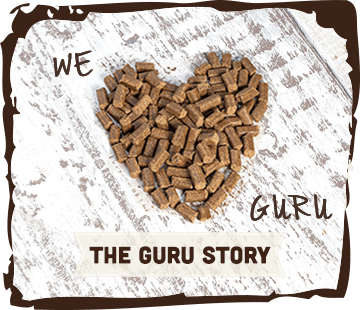 To find out more about the different types of food I’d suggest you head over to All About Dog Food and take a look at their feeding guide. 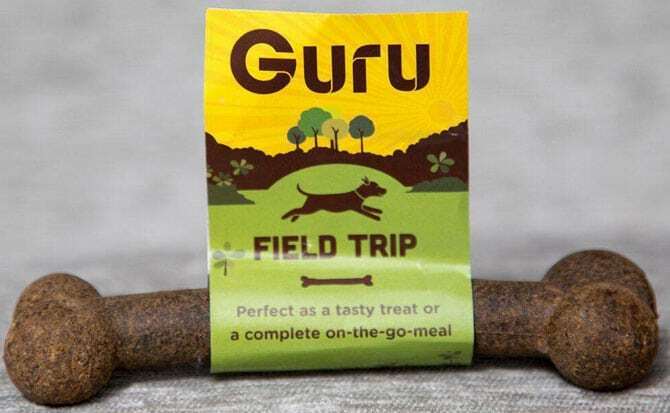 Guru pet food is one of the new cold pressed dog food companies and they recently sent Otto a sample to try along with one of their field trip bones, a handy sized treat which can also be a meal in itself. Well when Otto smelt the food he went mad for it, trying to jump up at the side and steal it away! This is always a good sign. With the small sample we gave Otto a few of the little nuggets of food as when trying new food it’s good to see how they take to it. The answer was it was gone before I had time to get my camera ready! With the field trip bone I was a bit quicker off the mark, as you can see from the photos. I liked the idea of being able to have a treat or meal in a handy size which you can’t do with raw food treats. Otto obviously liked the idea too as he chewed through it in no time. If you’re interested I’d suggest to learn more about cold-pressed food you check out the Guru website where they have a wealth of information available. 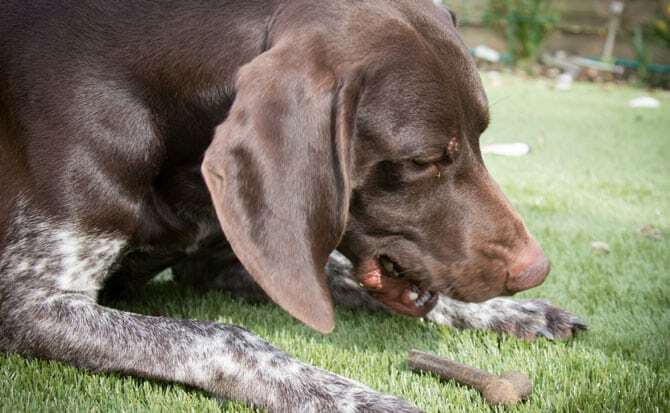 If you are interested the various types of dog food and reviews on them from dog owners take a look at All About Dog Food, a really useful website. 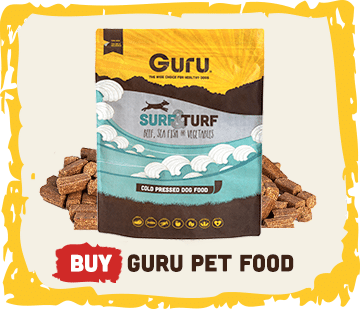 Interestingly for me Guru and Natural Instinct receive similar scores and positive reviews on All About Dog Food. If RAW becomes unmanageable in the future I’d be confident to try switching to Guru. For now I’d be keen to keep using the treat bones as handy snacks for when we’re out and about for a day trip. Otto tells me he’d be happy with that too!